I checked out the original tweet and the contest details and decided to retweet as well, you’ll never know. I never win things but now I did. 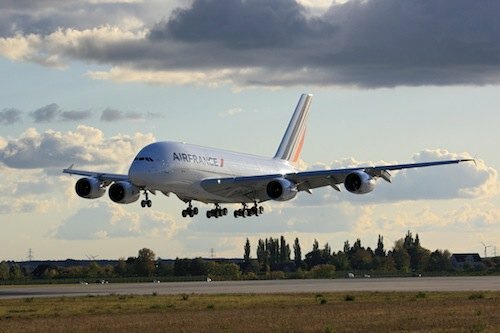 So on 7 October we’ll be flying in this gigantic plane, the biggest passenger plane in the world, to Paris, making a lot of people jealous. This plane is normally not flying on the Paris-Montreal route, but it’s a special flight celebrating the 60th anniversary of Air France in Canada. Okay, Paris is not my dream destination, that was Thimphu, the capital of the kingdom of Bhutan, who’s former king invented the GNH index, the Gross National Happiness Index. But I’m sure we’re going to have fun. Now we’re researching a cheap hotel in Paris. If you know one, please leave a comment. Update: No need for an hotel anymore. A friend offered to loan us her apartment in the centre of Paris for the weekend! Thanks for all the tips, in comments or by email. Hey, congratulations! How long will you be in Paris? Time for a small side trip to the Netherlands? It’s only a 4 day trip, unfortunately. We’re flying back on Monday, so no time for side trips. They didn’t divulge how they picked the winner, I hope my unconventional destination made me win. It must have, because random lotteries are prohibited in Québec. Still, I thinks it’s incredibly cool. I hope they serve you lots of free champagne on the flight. Or something else if you don’t want alcohol. So very cool to win a trip. We stayed in Paris twice, leme see if I can still find the hotel back, it was pretty neat for a cheap price. Smack down in the middle of Montmartre. Hello, this is your blog writing to you. I’m feeling kind of lonely. You haven’t forgotten me, have you? If I could make a sound I’m sure it would be a whining, whimpering sound. You do care about me, don’t you? Don’t you?